مرزبان, فهیمه, رفیعیان, مجتبی, سیدالحسینی, سید مسلم. (1397). پهنه‌بندی تراکم ساختمانی حوزه جنوب‌غربی شهر مشهد. معماری و شهرسازی آرمان شهر, 11(23), 333-346. فهیمه مرزبان; مجتبی رفیعیان; سید مسلم سیدالحسینی. "پهنه‌بندی تراکم ساختمانی حوزه جنوب‌غربی شهر مشهد". معماری و شهرسازی آرمان شهر, 11, 23, 1397, 333-346. مرزبان, فهیمه, رفیعیان, مجتبی, سیدالحسینی, سید مسلم. (1397). 'پهنه‌بندی تراکم ساختمانی حوزه جنوب‌غربی شهر مشهد', معماری و شهرسازی آرمان شهر, 11(23), pp. 333-346. مرزبان, فهیمه, رفیعیان, مجتبی, سیدالحسینی, سید مسلم. پهنه‌بندی تراکم ساختمانی حوزه جنوب‌غربی شهر مشهد. معماری و شهرسازی آرمان شهر, 1397; 11(23): 333-346. 3دانشیار گروه شهرسازی، دانشکده هنر و معماری، دانشگاه آزاد اسلامی واحد مشهد، مشهد، ایران. نقش پایه‌ای تراکم ساختمانی به‌عنوان ابزاری مناسب برای تحقق سیاست‌های شهری در جهت دستیابی به توسعه پایدار شهری از یک سو و موفقیت اندک طرح‌ها در زمینه تراکم ساختمانی به‌دلیل فقدان مطالعات پایه‌ای علمی و کافی در روند تعیین تراکم و نگرش غالب اقتصادی به موضوع تراکم در سیاست‌های شهری ایران از سوی دیگر، توزیع تراکم ساختمانی در راستای اصول و معیار‌های توسعه پایدار و با در نظر گرفتن تمام عوامل مؤثر بر تراکم ساختمانی و ابعاد زمان، مکان و مقیاس را ضروری می‌نماید. این نوشتار علاوه بر پی‌جویی شاخص‌های مؤثر بر توزیع تراکم ساختمانی، نوع و نحوه ارتباط بین این شاخص‌ها در محدوده مورد مطالعه؛ پهنه‌بندی تراکم ساختمانی را در مناطق 9 و 11 شهر مشهد با استفاده از 1GIS دنبال می‌کند. روش تحقیق حاضر مبتنی بر روش تحلیل تلفیقی متناسب با اهداف تحقیق تدوین شده است؛ در تحلیل‌های آماری (غیر فضایی) از رگرسیون چندگانه جهت آزمون همبستگی میان متغیر‌های مستقل و وابسته و روش تحلیل سلسله مراتبی(AHP) جهت تعیین وزن معیار‌ها و زیرمعیار‌ها استفاده شده و در تحلیل‌های فضایی، به‌کارگیری روش روی‌هم‌گذاری شاخص‌ها (Index Overlay) و ابزار‌های تحلیل فضایی سیستم اطلاعات جغرافیایی(GIS) مبنا قرار گرفت. در نهایت پس از انجام تحلیل‌های فضایی و آماری مذکور، نتایج، وجود رابطه معنادار بین شاخص‌های اقتصادی، اجتماعی جمعیتی، کالبدی فضایی، عملکردی، محیطی به‌عنوان متغیر‌های مستقل و تراکم ساختمانی به‌عنوان متغیر وابسته را تأیید می‌کند. نتایج حاصل از تراکم ساختمانی پیشنهادی نشان می‌دهد که بیش از 45.12 درصد از سطح محدوده مورد مطالعه بیشینه تراکم ساختمانی (تراکم ساختمانی زیاد و خیلی‎زیاد)، 35.21 درصد با حالت تراکم ساختمانی متوسط و 19.68 درصد، تراکم ساختمانی کمینه (کم و بسیار کم) را شامل می‌شوند. بیشینه تراکم ساختمانی در مرکز حوزه و کمینه آن در جنوب و جنوب‌غربی حوزه متمرکز شده است. Adabkhah, M., Poorjafar, M., & Taghvaee, A. (2003). Study of Building Density and Provide a Proposed Model for Determination FAR According to the Transit Network-Case Study: Allahieh Neighborhood of Tehran. HONAR-HA-YE-ZIBA Journal, 13, 16-31. Ardeshiri, M. (2000). About Comprehensive Plan in Iran. City Magazine, 10. Azizi, M. (1998). Density in Urban Development Projects, A Theoretical View of the Problem, Factors and Effects. HO,The First Year, 2, 24-32. Azizi, M. (2002). Evaluation of the Physical-Spatial Effects of Tower-Making in Tehran, Case Study: Kamraniyeh and Ramaniyeh Neighborhoods. HONAR-HA-YE-ZIBA Journal, 4(5), 33-36. Azizi, M. (2003). The Role of Urban Desity in Urban Development. Researches of the First Construction Seminar in the Capital, 17 &18 February, Tehran. Azizi, M. (2009). Density in Urbanization, Criteria for Determining Urban Density. Tehran: Tehran University Publishing. Azizi, M., & Jamalabad, F. (2016). A Model for Determining Desirable Construction Density (F.A.R) for Neighborhoods with Especial Respect to Cultural Factors (The Case Studies: Iran & Takhti Neighborhoods, Tehran. HONAR-HA-YE-ZIBA Journal, 2 (12), 33-44. Azizi, M., & Moini, M. (2011). An Analysis of the Relationship between Environmental Quality and Building Density. HONAR-HA-YE-ZIBA Journal, 45, 5-14. Burton, E., Williams, K., & Jenks, M. (1996). The Compact City and Urban Sustainability: Conflicts and Complexities, in The Compact City: A Sustainable Urban Form?. E & FN Spon, London. Faranahad Consulting Engineers .(2009). Comprehensive Plan of Mashhad Metropolis, Basic Studies of Urban Environmental Quality (Safety and Security), First Edit, Rasearch and Planning Center of Mashhad City. Ghamami, M. (2008). Aboat the Issues of the Urbanization Day in Iran Today (Researches). Tehran: Agah Publishing Co.
Ghorbani, R., & Jafari, F. (2015). Analysis of the Location of Construction Density in Urban Development Projects of Tabriz City. Geography and Planning Magazine, 53, 253-276. Hall, P. (1965). Land Values. London, Sweet and Maxwell, 67-62. Karimi, A., Delavar, M., & Mohammadi, M. (2009). A Model to Determine the Optimal Urban Density by Using Land Information Systems, Case Study: Esfahan Khomeini City. HONAR-HA-YE-ZIBA Journal, 37, 17-26. Kushik, Ogh. (2005). Determining Development Density Using the Urban Carrying Capacity Assessment System. Mashhoodi, M. (2010). Building Density and Population Density in Cities. Tehran: Mazinani Publishing. Massoudi Magham, M. (2002). The Obstacles Against the Success of Urban Density in Shiraz City Master Plan and Provide Strategies for Realization it. Thesis Master of Science in Urbanism, Faculty of Arts and Architecture, Shiraz University. Ministry of Housing and Urban Development. (1997). Aspects of Housing Economics, Findings of Several Surveys on Housing. 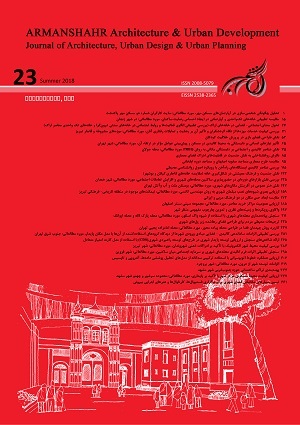 Tehran, National Land and Residential Organization, First Published. Naghsh Piravash Consulting Engineers. (2011). Detailed Plans of Southwest of Mashhad with Urban Design Approach. The First Cover: Review Vision, Land Use System, Access and Movement, Rasearch And Planning Center of Mashhad City. Narimani, K. (2001). The Necessity of Revision in the Building Densities of Shiraz. Journal of the Engineering Organization of fars Province, 29, 3-5. Ottensmann, J. (1977). Urban Sprawl, Land Value and Density of Development. Journal of Land Economics, 389-400. Part Consulting Engineers. (2001). Zoning Plan and Determination of Areas with High Potential for High-Rise in Mashhad. Pour Mohammadi, M., & Ghorbani, R. (2003). Aspects and Strategies of Urban Space Compression Paradigm. Quarterly Modarres Human Sciences, Seventh Period, 2. Rezazadeh, R. (2003). Cash on How to Formulate Current Congestion Control Policies and Suggested Solutions. Magazine of the Municipalities, 62. Salehi, B. (1988). Investigation of the Factors Affecting the Determination of Residential Density in Urban Development Projects. Architecture and Urbanism Magazine, 2, 12-16. Tajdar, V. (2009). Analysis and Assessment of Health Status with Urban Planning Approach in Mashhad Metropolis. Thesis Master of Science in Urban Planning, Faculty of Arts and Architecture, Tarbiat Modares University. Vahidi, G. (2006). Optimal Urban Density. BSc Thesis, Faculty of Arts and Architecture, Islamic Azad University, Mashhad Branch. Zebardast, E. (2001). Application of Analytical Hierarchy Process in Urban and Regional Planning. HONAR-HA-YE-ZIBA Journal, 10, 12-21.